Open the Administrative Tools window. In Windows 7, look under System and Security. In Windows Vista, under System and Maintenance. Open the Task Scheduler icon. If prompted, type the administrator’s password or click Continue. The Task Scheduler window appears. On the left side, select the top item, Task Scheduler (Local). You see the Task Scheduler Summary. It provides a review of your tasks, including which tasks have run and which are active. On the left side, choose Task Scheduler Library. Tasks are organized into folders. 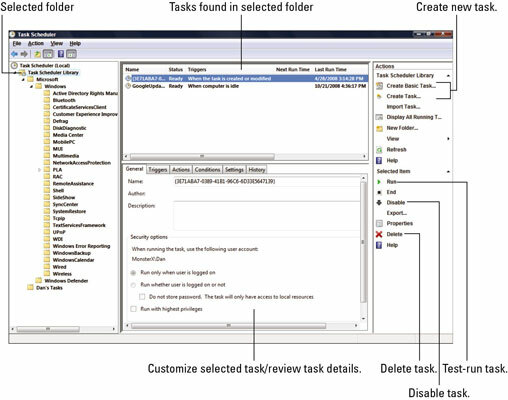 The Task Scheduler Library folder is the “root folder” for all tasks. 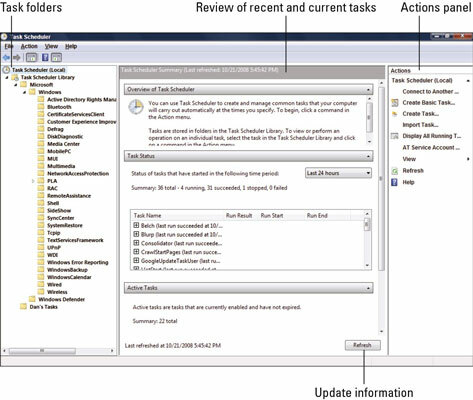 Additional tasks in the Task Scheduler window are organized by owner. You see a folder for Microsoft, which contains subfolders for Windows and Windows Defender. When the Windows folder is open, it shows additional subfolders for tasks related to specific programs or tools in Windows. Open the Microsoft folder, and then the Windows folder, and finally the System Restore folder. The System Restore folder contains tasks that periodically create restore points for system recovery. The top part of the window describes the tasks for the System Restore folder. One task that’s listed, SR, is shown as Ready. You can also see the next and last run times, which verifies that the task is performing properly. On the General tab at the bottom of the screen, you see the task’s description. You can also see that the task is scheduled to run whether you’re logged in or not. A trigger is an event that prompts a task to run. It can be a time of day or it can be an action, such as system startup. An action is what a task does — run a program, display a message, or make another thing happen, set a restore point, defragment the hard drive, or send an email message, for example. Yes, the action shown for setting a restore point is technical. But keep in mind that you’re viewing a Windows task. The tasks you set up will not be as complex. The settings on the Condition tab refine when the task is run. The task doesn’t run unless all the conditions are met. The Settings tab lists further control over the task, including when to stop a task that might run amok. You find on the History tab some information about when the task was last run and whether it ran successfully. That’s your way to test whether your tasks are doing what you set them to do. Close the Task Scheduler window when you’re done poking around. You can choose any task in any folder to study how it’s set up, how it works, and whether it’s run. In fact, reviewing the already-created tasks is a helpful way to find different ways to configure your own tasks.